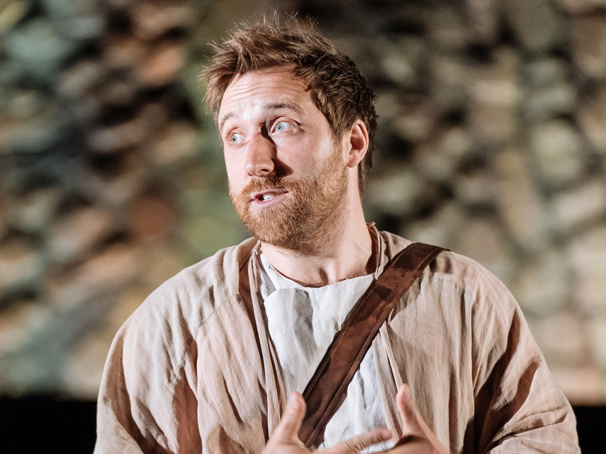 Joseph Kloska has become something of a Royal Shakespeare Company regular of late and steps up a career notch with his co-starring performance opposite Tony winner Richard McCabe (The Audience) in the epic new play, Imperium, now in previews at the Gielgud Theatre. Adapted from Robert Harris’ trio of historical novels. Mike Poulton’s seven-hour, two-part production casts Kloska as Tiro, the slave-turned-secretary to McCabe’s Cicero. The warmly engaging actor talked to Broadway.com about meaty theater and timeless themes. How does Tiro slot into the enormous canvas on view in Imperium? First off, he was a real man! Robert Harris’s genius in his three books is to have discovered that Cicero had a very well-known slave to whom he gave his freedom and who then ended up as Cicero’s secretary and sidekick He was this bright, intelligent man who also happened to invent shorthand. Is it tiring to perform the two plays [Conspirator and Dictator] across a single day? I suppose in the sense that Richard McCabe and I are onstage every moment of the sweep of the two plays [which can be seen separately or individually]. But I do enjoy really getting to be present in the events of the play and to examine them as they’re happening. Also, it’s nice with these plays not to have to worry about quick changes: I go on in one costume and come off in the same one. Have you and Richard McCabe ever felt the urge perhaps to swap roles, as did Juliet Stevenson and Lia Williams in Mary Stuart? No, I don’t think I could reach his heights of Ciceronian oratory! I have a large role but [McCabe] must have one of the largest roles I have ever seen; it’s got these extraordinary pieces of rhetoric. How much do we actually know about Tiro? The real Tiro wrote a life of Cicero which disappeared somewhere in the shrouds of time, but Harris brilliantly decided that his way to tell the story would be from Tiro’s perspective, so that the character is communicating this piece of history directly to the audience over a gap of 2000 years. Do you ever get the urge to improvise when you break the fourth wall? Well, we had Boris Johnson [the U.K. foreign secretary] in the other night, but he was somewhere out there in the stalls, and I couldn’t see him. When we were in Stratford-upon-Avon at the [more intimate] Swan Theatre, the audience was right there: I would ask questions and occasionally they would answer back [laughs]. Does this slab of centuries-old history resonate with today? The plays present the story that happened at that time, and then the story invites the parallels. What happened then is so similar to what happens again and again through history, but it’s not as if the plays have to stomp all over it and go, “Hey, this is how it was and also how it is” –the parallels are so evident. One thing is clear is that politicians haven’t changed. They are the same now as they were then: greedy, vain, sometimes duplicitous. They live in the compromise between their ideals and what is pragmatic to do. Do the plays chime with your own historical awareness? I’m no expert on this period, but I did study modern history at university, and it just fascinates me. I’ve also traveled to lots of Mediterranean and Roman sites and, of course, we’ve got these amazing Roman sites in Britain; all of it interests me, I must say. Is Imperium itself Shakespearean insofar as it was part of a sequence of Roman-themed RSC productions, most of which inevitably were by Shakespeare? It felt to me as if our play complemented the rest of the work in the season. Shakespeare only gives Cicero a handful of lines in his great play Julius Caesar, so Imperium is a response to that: Cicero was the greatest speaker of his age, and for whatever reason Shakespeare didn’t give him room. Can you see this going the way of Mike Poulton’s previous RSC epic, Wolf Hall, which transferred amid rave reviews to Broadway? Imperium shares a lot of the DNA of Wolf Hall in terms of being this epic event of storytelling on a huge scale. And as with Wolf Hall, you follow a central character and observe his decisions and his mistakes, The difference is that in our play, you get some answers—it’s like Wolf Hall with an ending [laughs]. So, New York might go for it? Clearly, I think it would play brilliantly in New York. Americans have this very deep relationship with Roman democracy and the Founding Fathers understood how democracy functioned in the Roman republic, so it feels to me like it could play well. To what do you attribute the apparent appetite out there right now for epic theater, from Wolf Hall through to Angels in America, Matthew Lopez’s two-part The Inheritance and more? Perhaps people want a deeper, more profound journey into another world and that’s what is available in these great epic presentations. Angels was extraordinary in the way it invited you to be in that reality, so in a world where things are speeding up, people may want something more satisfying and longer-lasting. What are you especially proud of away from your work onstage? I had a wonderful episode with Claire [Foy] on [TV series] The Crown, as Lord Porchester, or “Porchie,” who became the Queen’s racing manager and looked after her horses; there was always a romantic whisper around them even as they remained best friends. There's Peterloo, the new Mike Leigh film in which I play Richard Carlile [the 19th-century publisher and political agitator]. The movie reminds us of this incredibly important moment in history where people used anger and outrage to try to achieve and cement political change. Mike’s feeling is that this time has basically been forgotten and we need to remember it; it’s very political. Do you gravitate naturally towards politically-themed work? Well, I have a lot of friends in politics and I think of myself as a political person and try to involve myself in causes that are important to me. But I think maybe in terms of my work, I’ve had enough history for a while; I need to do a romcom!